That’s very amusing. 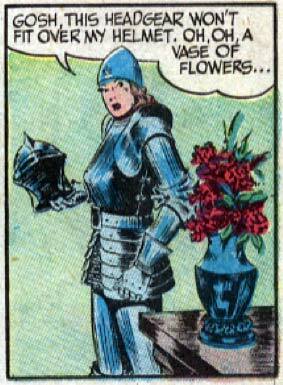 It’s a good thing that the metal smiths were able to make armor form fitted to Joan Crawfordy shaped women. That chestal region could do some serious damage to an opponent in battle – a bit like Madonna. Does Bulletgirl really need two helmets? Oh, right – her father doesn’t recognize her in the first one. Her headgear wouldn’t fit over my helmet if you know what I’m saying…. oh, oh a vase of flowers.